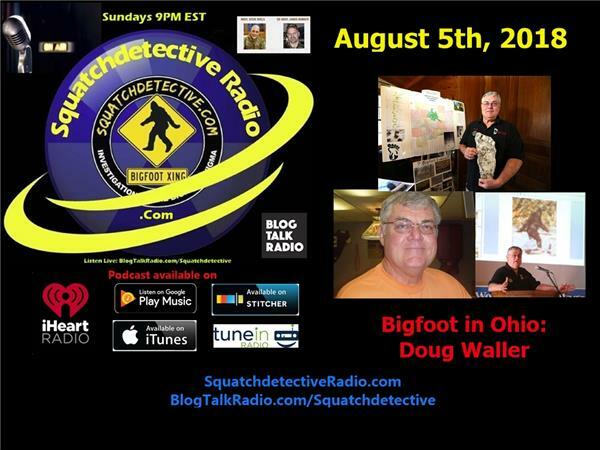 Join us Sunday August 5th, 2018. at 9 PM Eastern as Steve & Chris welcome Ohio researcher / author Doug Waller. Doug is a researcher, authorer and lecturer on the topic of Bigfoot and is a member of the Southeastern Ohio Society for Bigfoot Investigation (SOSBI). Bigfoot researcher and author Doug Waller has been fascinated with stories of Bigfoot for over thirty years and in 2006 he began seriously reading and researching evidence and eyewitness reports. In 2008, he formed the Southeastern Ohio Society for Bigfoot Investigation. The purpose of the group is to provide a safe, open forum for Bigfoot believers and eyewitnesses to come together to share Bigfoot stories and reports without fear of ridicule. Doug's book include: Standing in the Shadows: Bigfoot Stories from Southeastern Ohio, Hidden Encounters: Bigfoot Stories from Southeastern Ohio and Beyond and Screams in the Night.